Transform a pizza box into a solar oven to harness the sun's energy to make a s'more (melted chocolate and marshmallow between two graham crackers). Try it! It’s fun AND delicious! **Note: This experiment can be done with other types of food - try making nachos with tortilla chips and shredded cheese, or english muffin pizzas. If experimenting with a group of children, ask parents about any potential food allergies when choosing foods. Ask student to create a testable question (a hypothesis). Example: Will it take longer than 10 minutes to cook the s'mores? Tape layers of clear plastic across the opening that you cut in the lid. Aim your oven at the sun and check in every few minutes to check progress. Is the chocolate melting? Where does most of the energy on our planet come from? What is the purpose of the aluminum foil? The foil has a reflective property that concentrates the sun’s rays down into the box. Why did we use black paper and not a different color? Black absorbs ALL of the sun’s rays and keeps the most heat in the box. Why do we need the plastic wrap? The plastic wrap provides insulation so the heat can’t escape. It has to be transparent so the light can get through. 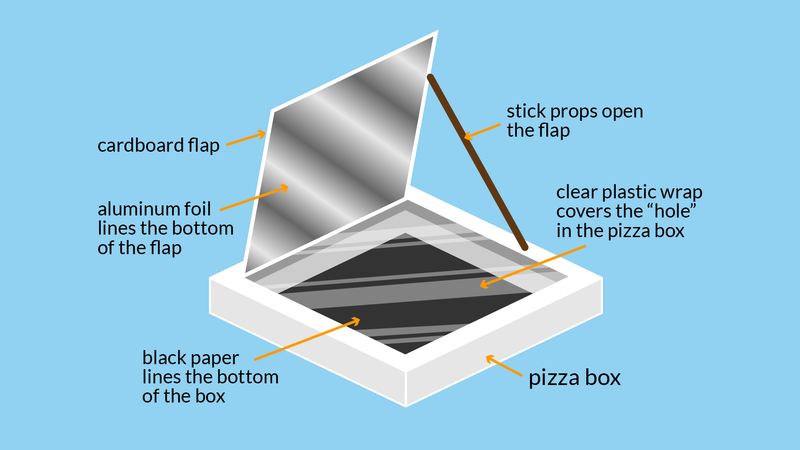 How does the angle of the “flap” of the solar cooker affect the cooker temperature? Changing the angle of the flap will reflect more or less of the sun’s rays down into the box. How can you make it cook faster? You can adjust the angle of the flap to try to reflect more of the sun’s rays into the box. You can also add some wadded newspaper insulation around the outside of the box to keep more heat inside. Do you think it would take the same amount of time to melt four s'mores as it does to simply melt one? It would likely take longer since heat is not distributed evenly in the solar oven, but do an experiment to find out! Is the evidence and data you are collecting helping you test your hypothesis question? Answers will vary based on the scientist. What provided the heat to melt the s'mores? Solar radiation working with the components of the oven. How do you think it would work on an overcast day? The sun is still there, so it should still work, but it might take longer. Remember you can still get a sunburn on an overcast day, so the sun’s rays still hit the Earth’s surface! Which factors impacted the solar oven the most? Answers vary based on your actual experiment, but may include things like the tin foil, the plastic wrap, or the weather. If you could start over, what might you do differently? Solar ovens use solar energy—light and heat from the sun—to cook food. The oven is designed to absorb more heat than it releases. Rays of sunlight come to the earth at an angle. The foil reflects the ray, and bounces it into the opening of the box. Once it has gone through the plastic wrap, it heats up the air that is trapped inside. The black paper absorbs the heat at the bottom of the oven, and the plastic wrap helps the heat stay inside the box to cook the food. The concept behind creating the solar oven is similar to the concept of the Earth's greenhouse effect. The greenhouse effect is a warming of the Earth's surface and the air above it. It is caused by gases in the air that trap energy from the sun. These heat-trapping gases are called greenhouse gases. The most common greenhouse gases are water vapor, carbon dioxide, and methane. These gases create a blanket-like effect, like the plastic wrap in your solar oven, that traps the sun’s heat. Without the greenhouse effect, Earth would be too cold for life to exist. Light energy from the sun in the form of electromagnetic waves, including visible and ultraviolet light and infrared radiation. An apparatus or structure in which atomic material can be made to undergo a controlled, self-sustaining nuclear reaction with the consequent release of energy. A type of electromagnetic radiation; often referred to as heat rays. Infrared radiation is electromagnetic radiation of a wavelength longer than visible light but shorter than microwave radiation. Sun rays which have reached an object without obstruction. Sun rays reaching an object with an obstruction creating a barrier between the rays and the object. 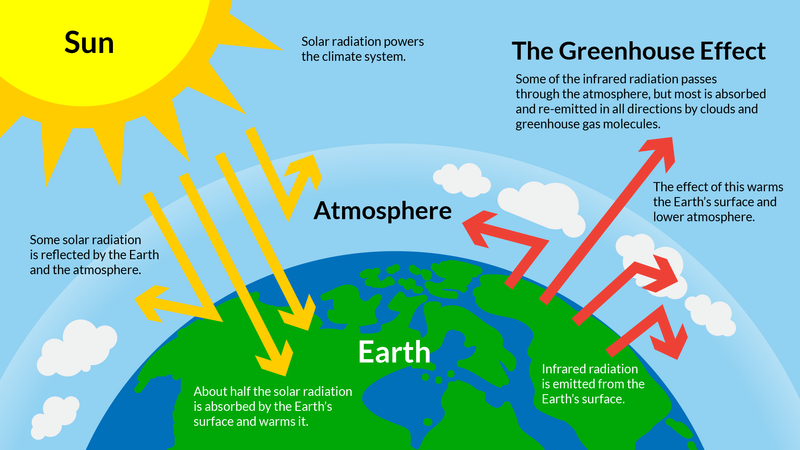 The greenhouse effect is a warming of Earth's surface and the air above it. It is caused by gases in the air that trap energy from the sun. These heat-trapping gases are called greenhouse gases. The most common greenhouse gases are water vapor, carbon dioxide, and methane. Without the greenhouse effect, Earth would be too cold for life to exist. Insulating materials reduce the flow of heat or electricity. Thermal insulation decreases the flow of heat from a hot region to a cooler one.